Description: Jubilee Cat is a large Smooshee from the Smuggler Surprise Packages line. This cat was sold with a square gift box that she can be smooshed into. The box has a removable lid with an oval-shaped hole in the top. When the cat is in the box, her hair bow can pop through the top to look like a gift wrapped box with a bow on top. Designed for children ages 4 years and older. FPT17072 - Jubilee Cat - Large stuffed yellow Smooshees cat with a printed face and other features. She has blue and purple eyes with an orange ring around one eye, a pink heart-shaped nose, a mouth with a pink tongue sticks out, and multi-colored streamer whiskers. She has multi-colored confetti and streamers on her back and tail. She has a magenta scarf around her neck with multi-colored confetti on it, and magenta metallic pads on the bottom of her feet. She has a long purple strand of hair and a large light blue bow on top of her head. FPT17073 - White square plastic "gift wrapped" box with an attached lid. 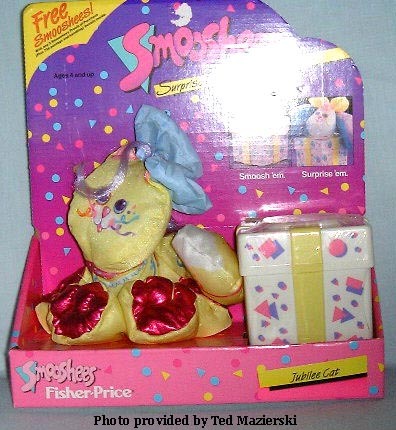 The lid has a square-shaped hole in the center that the accessory Smooshee's bow can fit through to look like a bow on top of the "gift box". The box and lid have pink and purple designs on it, and yellow ribbons on the sides. Marked "©1988 FISHER-PRICE, MADE IN HONG KONG" on the bottom. Measures 3-3/4" square.